After five years of large-scale upgrade work, SuperKEKB, an electron-positron colliding accelerator at KEK in Japan, has started test operations. SuperKEKB succeeded in circulating and storing beams in the electron and positron rings, which is the first milestone of its commissioning. On February 1, 2016, the High Energy Accelerator Research Organization (KEK) started test operation of the SuperKEKB electron-positron collider. This machine represents a major upgrade from the previous KEKB accelerator, and is the culmination of years of construction that started in the second half of 2010. On February 10, SuperKEKB succeeded in circulating and storing a positron beam in the positron ring, and on February 26, succeeded in circulating and storing an electron beam in the electron ring as well. Machine tuning will continue until the end of June 2016, followed by installation of the Belle II detector1 upgrade and new superconducting electromagnets for the final focus at the collision point. Machine tuning will then be carried out to achieve collisions of the electron and positron beams. SuperKEKB has adopted and will realize for the first time a nano-beam large-angle crossing collision scheme2, with the beam size at the collision point reduced to 1/20th of the beam size of KEKB. The stored beam current will also be increased to twice that of KEKB, with the final aim of achieving a collision performance 40 times higher than that of KEKB. The rate of collisions produced by SuperKEKB will be several tens of times larger than that of KEKB. The aim is to pursue the mystery of the disappearance of anti-matter during the early, developmental processes of the universe, and to discover and clarify new physical laws that go beyond the Standard Model of particle physics. In 2001, the KEK B Factory accelerator (KEKB), which was the predecessor to SuperKEKB, achieved the best beam collision performance (the highest luminosity3) in the world. Following that achievement, KEKB continued to set new luminosity records. By analyzing the large quantities of data generated by the collisions of electron and positron beams at KEKB, the Belle group experimentally verified the Kobayashi-Maskawa theory by observing the first signal of CP asymmetry4 in B mesons. Thus, KEKB has been contributing to the study of elementary particle physics and accelerator physics for many years. The Kobayashi-Maskawa theory explains the difference between matter and anti-matter that was experimentally discovered in 1964. Since there is almost no anti-matter presently found in nature, while equal quantities of matter and anti-matter were present at the beginning of the universe, there must be a fundamental difference between matter and anti-matter. However, the Kobayashi-Maskawa theory alone cannot completely explain the deficit of anti-matter. Hence, it is necessary to increase the experimental data samples and do further research. For this purpose, after the operation of KEKB terminated in June 2010, the KEKB accelerator group undertook the project of upgrading KEKB to SuperKEKB, for higher luminosity. Since then, the KEKB electron and positron rings, each of which has a circumference of 3,016 m, have been upgraded. The various modifications include replacing the beam pipes with new types, upgrading and increasing the number of electromagnets and the power sources for the electromagnets, and increasing the power of the radio-frequency accelerator system, while reusing the existing facilities as much as possible. The 600 m-long electron and positron injector has also been upgraded by developing a new electron gun and positron source, and by improvement of the precision alignment of the accelerator beam pipes and electromagnets. In SuperKEKB, the electron and positron bunches circulate around each ring by using electromagnets that control the particle orbits along with radio-frequency accelerating cavities that provides the beams with power, and various other types of devices. For physics experiments at high luminosity, a large number of bunches must be stably stored in the rings. The electron and positron bunches travel around the rings with velocities close to that of light, with the beam currents being measured by current transformers. Before beginning test operation of the storage rings, machine tuning of the electron-positron injector started at the end of January 2016. The beam transport lines, the positron ring and the electron ring were then successively commenced. The positron beam was successfully stored in its ring for the first time on February 10. Stable storage of positron beam currents exceeding 100 mA has already been achieved. Following storage of the positron beam, an electron beam was successfully stored in the electron ring for the first time on February 26, 2016. During Phase 1 operations up to June 2016, the accelerator will be tuned to achieve stable storage of low emittance5 beams (beams with narrow spread). Vacuum scrubbing, which is the cleaning the surface of the beam pipes using synchrotron radiation generated by the beams, will be carried out as well. Phase 1 commissioning is required so that the Belle II detector can be rolled in to the collision point for upcoming Phase 2 operations. The Belle II detector is being assembled by the Belle II collaboration6, an international research organization hosted by KEK IPNS (Institute of Particle and Nuclear Studies). Installation of the Belle II detector upgrade at the collision point is planned after the completion of Phase 1 operation. Prior to this during Phase I, seven types of compact sensors (BEAST measurement instruments7) have been installed at the collision point to investigate the effects of electromagnetic showers generated by beam particles that deviate from their orbits during the physics experiment. In addition to the installation of the Belle II detector, superconducting electromagnets that focus the beams to a few tens of nanometers at the collision point will be installed, and beam tuning with squeezed beams to increase luminosity is scheduled to begin in the fall of 2017 (Phase 2 operation). For Phase 2 operation, the positron beams must have low emittance before injection into the positron ring. To accomplish this, a new positron damping ring, with a circumference of 135 m, is being built. The installation and tuning of the damping ring in the completed tunnel and buildings are underway. Using the increased collision rate at SuperKEKB, the large quantities of collision data observed by the Belle II detector will reproduce a large number of extremely rare phenomena that must have occurred during the initial stages of the universe. The aim of this work is to discover and clarify new physical laws that go beyond the Standard Model, and to pursue the mystery of the disappearance of anti-matter during the early, developmental processes of the universe. 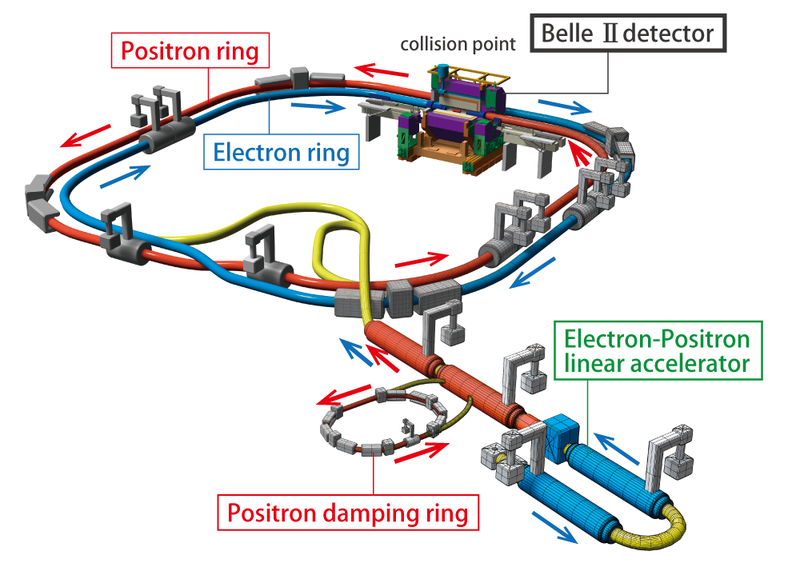 1 Belle II detector: A measurement device designed for determining the types and measuring the momentum of particles generated by reactions that occur as a result of collisions between electrons and positrons in SuperKEKB. Belle II is an upgrade of the Belle detector used in KEKB. It has a length, width, and height of approximately 8 m; its weight is approximately 1,400 tons. 2 Nano-beam large-angle crossing angle collision scheme: A new scheme for colliding two beams at the collision point, by crossing them at a large angle, which was originally proposed by Dr. P. Raimondi of the National Institute for Nuclear and Particle-Physics Research in Italy (currently at the European Synchrotron Radiation Facility). This collision scheme has been adopted by SuperKEKB, with a crossing angle of approximately 5 degrees. The “hourglass effect,” which reduces the ability to focus the entire bunch at the collision point, is significantly alleviated in this scheme; this makes it possible to further squeeze down the beam size at the collision point. 3 Luminosity: Luminosity is a measure of collision performance for a colliding beam accelerator. The rate of the collision events can be calculated by multiplying the luminosity and the collision cross-sectional area (a constant numerical value determined by the type of collision event). Larger luminosity leads to more numerous collision events, which makes it possible to investigate rare phenomena in detail. 4 CP asymmetry: Particles and anti-particles share the same basic characteristics other than the sign of their charges. If their other behaviors vary, they violate the conditions of CP symmetry. The Kobayashi-Maskawa theory is used to explain the breakdown of this CP symmetry between particles and anti-particles, which is referred to as CP asymmetry. 5 Low emittance: Emittance is a measure of the range of phase space occupied by the particles that comprise the beam bunch. Beams with smaller emittance can be squeezed down to a narrow region at the collision point; just as completely parallel rays of light can be focused into a single point. Low emittance must be achieved in a beam to achieve high luminosity. 6 Belle II collaboration: An international research collaboration established to gain physics knowledge by acquiring and analyzing data from beam collisions, through the construction, operation, and maintenance of the Belle II detector. More than 600 researchers have gathered from 23 countries and regions as of February 2016. 7 BEAST measurement instruments: A specialized detector that measures background arising from the beams before the Belle II detector is installed, which will enable to understand the behavior of the accelerator.